One of the easiest ways to personalize your iPhone 5 is to outfit it with a cool protective case, but for some people that just isn't geeky enough. These are the folks who might be interested in this do-it-yourself kit by iPhone5mod – it comes with all the parts and tools you need to replace an iPhone 5's back with a translucent plastic casing. Even the SIM card tray and the buttons on the sides are replaced with transparent alternatives. Now, a lot of you are probably wondering why one would swap a high-quality aluminum panel for a cheap piece of plastic. Well, let's say that the iPhone 5 is prone to scratching if not handled with care. Moreover, the kind of plastic that is used in the kit is resistant to fingerprints. 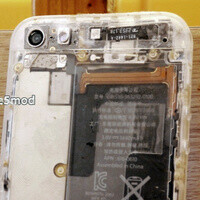 But most importantly, some might simply find it cool to be able to see what's inside of their iPhone 5 all the time. Needless to say, their warranty will be rendered invalid after the modification, but that's the sacrifice one has to make in order to own a unique iPhone. The translucent iPhone 5 kit comes in 7 different colors: pink, red, yellow, green, blue, white, and black. It can be ordered for about $40, and if you get yours today, iPhone5mod will throw in top and bottom panels of all available colors at no extra charge. Check out the video below to get an idea how a modified iPhone 5 looks like. Someone will actually trade Aluminum with plastic? We're going back in the time where Nokia phones had changeable cases for a dollar. Why would all the phone manufacturers want to ever place all the different back shell on their phones when we could get this stunning transparent shell on our phones?..... Hmm.... I dunno. Maybe to make it look better? It sounds like you're trying to be sarcastic here, but I actually like it. Not an iPhone fan, but I think it looks dope. It's like stripping away the $200-part of your phone, the logo.